Bishop Osco E. Gardin, Jr. (pronounced Gar-dean) is the son of Bishop Osco E Gardin, Sr. and Geneva V. Gardin, both of Gastonia, North Carolina. He was licensed to preach the gospel and ordained to the work of the same by the authority and order of the First Baptist Church located in Fayetteville, North Carolina. Bishop Gardin received his formal education in Canton, Ohio where he was born and raised. His post-secondary education took place at Shaw University, where he received a Bachelor of Arts degree in Behavioral Science, with a concentration in Sociology. Bishop Gardin pursued graduate studies at the Southeastern Baptist Theological Seminary, where he met the necessary requirements to receive a Master of Divinity degree. He received an honorary Doctor of Humanities degree from Lamp Light International Bible College and Seminary. For five years, Bishop Gardin served as Senior Pastor of the Trinity Missionary Baptist Church located in Danville, Virginia. During that time serving as a bi-vocational minister, Bishop Gardin was also employed as a teacher in the Danville Public School System. Currently, Bishop Gardin serves as Senior Pastor of the Elizabeth Missionary Baptist Church (EMBC), located in Monroe, North Carolina. Since his pastorate in December 3, 1995 this local assembly has been experiencing growth in every area of church life. Bishop Gardin’s local, social and civil involvements landed him on more than 12 community, city, county and state boards, to include, the former Union Regional Medical Center (CMC Union), the Union County Jail Life Skills Program, the Friendship Home and the North Carolina State Highway Patrol where he presently serves as a Chaplain. Bishop Gardin is currently leading EMBC in Phase One of a multi-million-dollar effort to connect church, families and community with the construction of a new day care and family life center, 1000 seat sanctuary and facilities for a charter school or Christian academy. 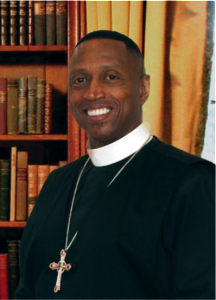 Bishop Gardin serves as prelate of the United Covenant Churches International (UCCI) an organization that has been created for the sole purpose of autonomous local churches working together to act on behalf of each member to assist each other in ministry and mission through co-operative and supportive ministry. Presently UCCI consists of seventy seven churches internationally. Bishop Gardin is loved and supported not only by the Monroe community, but also by his wife of 33 years, J. Latricia Gardin and their three children; daughter, Shameia Latrice, and sons, Osco III, Jarred Lamar and granddaughter Skylar.